...that Usze 'Taham is the only known Elite with claret-colored armor? ...that the Mombasa Inlet Plant was a Fronk's Formed Fish processing facility in the Mombasa Quays? ...that the BR55 battle rifle is replaced by the Suppressed SMG in Halo 3: ODST? 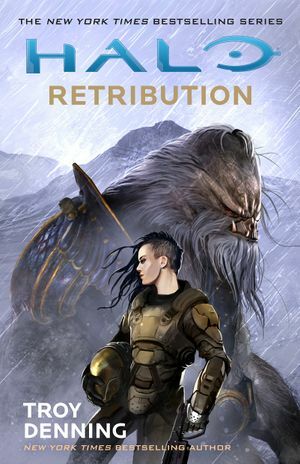 Halo: Retribution is a novel by Troy Denning. Having first appeared on Amazon's website, Retribution was officially announced on June 23, 2017, and was released on August 29, 2017. Set in late 2553, the novel follows up on Denning's Halo: Fractures short story A Necessary Truth, although many of the central characters from the preceding novel Halo: Last Light also make a return. “ December 2553. Less than a year after the end of the Covenant War, a string of violent incidents continues to threaten the tenuous peace in human-held space, culminating in the assassination of UNSC fleet admiral Graselyn Tuwa and the abduction of her family. It is a provocation so outrageous that the Office of Naval Intelligence must retaliate swiftly and ferociously—but only after its operatives identify her killer and rescue the hostages. The novel's cover is illustrated by artist Benjamin Carré, who also provided artwork for Halo Mythos. Retribution's official summary describes the Human-Covenant War as "thirty years of 'intergalactic' conflict". This is an incorrect usage of the term, as the war was never fought in more than one galaxy; a more appropriate word would have been "interstellar", which is defined as occurring between stars. The Battle of Installation 00 was the only battle of the war to be fought outside the galaxy, though not in another galaxy altogether, and the wording in the summary regardless implies the war was waged on an intergalactic scale consistently for its thirty-year duration. The novel's full cover illustration.